Nicolás Correa Service, S.A. has retrofitted two second-hand CORREA CF22/25 milling machines over the last few months and these were subsequently installed and commissioned at its customers´ plants, one in South Africa and the other in France. 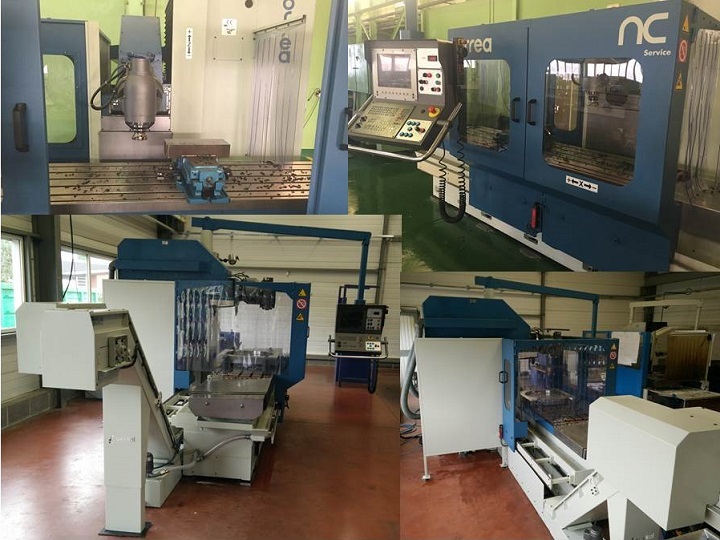 These two second-hand, fixed-bed milling machines were retrofitted by NC Service at its facilities. Among other features, this milling machine model is noted for its independent, tempered steel guideways and resin counter-guides on all three axes, tempered and ground ball bearing spindles on all movements and a hydraulic counterweight for the vertical movement. Both machines offer an X axis travel of 2500 mm, and 800 mm on both the Y and Z axes, while they also feature a universal head with hydraulic tool clamping and are fitted with a TNC-426 Heidenhain numerical control and an HR-410 electronic wheel. This CORREA milling machine model offers great market potential, evidenced by the fact that, over the last few months, customer demand has increased sharply. This extremely versatile, rigid, high precision milling machine is ideally sized for small and medium enterprises and machining workshops. The most salient point of the retrofit of this milling machine model is that, for the first time in its history, NC Service has made a sale to the South African market. This CORREA CF22/25 milling machine was purchased by a leading company in surface engineering in South Africa and, following retrofitting work in Burgos, it was subsequently commissioned at this customer´s plant by our technicians. With the purchase of this CORREA milling machine, this company, which boasts a certified commitment to quality, will increase its precision machining capacity in order to better fulfil customer demands. This was NC Service´s first inroad into the South African machining market and, given the fact that this market is clearly growing, we are expecting new opportunities there for our retrofitted milling machines. This country, with a population of approximately 53 million inhabitants and an average per capita income of 6,000 dollars, is one of the largest economies and the leading importer in the African continent, accounting for 30% of the GDP of the continent. It offers tremendous opportunities for companies in sectors such as the industrial sector. This, together with the outstanding reputation of Spanish companies already present in sectors such as engineering and energy, makes South Africa a country with considerable potential for our company. On the other hand, another CORREA CF22/25 milling machine was sold to a French company with almost 30 years´ specialist experience in industrial machining and which has expanded considerably over the last few years. The purchase of this milling machine which, following retrofitting work, was commissioned in June this year, comes within the context of this company´s growth policy. Thanks to the acquisition of this machine, this customer can now increase its work capacity while still maintaining its high quality machining.